This article is about the men's team. For the women's team, see Bosnia and Herzegovina women's national football team. The Bosnia and Herzegovina national football team represents Bosnia and Herzegovina in association football and is governed by the Football Association of Bosnia and Herzegovina. Until 1992, Bosnian footballers played for Yugoslavia. Bosnia and Herzegovina achieved their best result when they reached the 2014 FIFA World Cup as winners of their qualifying group. They were eliminated after group stage narrow losses to Argentina and Nigeria and a win over Iran. The team has appeared in numerous other qualification play-offs, in 2010 FIFA World Cup play-offs loss to Portugal, as well as qualifying play-offs for UEFA Euro 2012 and UEFA Euro 2016, losing to Portugal and Republic of Ireland respectively, preventing the team from reaching their first UEFA European Championship. Its' two home stadiums are Grbavica (Sarajevo) and Bilino Polje (Zenica). The team's highest FIFA World Ranking was 13th, achieved in August 2013. Bosnia and Herzegovina have seen a steady rise in their fortunes on the international football stage in recent times. Historically, Bosnia, a war torn and divided nation, has managed multiple playoff appearances and has qualified to one FIFA World Cup. More often than not, the team produces solid results in qualifiers and challenges for a top spot. From 1920 to 1992, the players lined out for Yugoslavia, but following the outbreak of the Bosnian war and subsequent independence, a new football nation arose from the ashes. The early period saw Bosnia and Herzegovina have to wait until the 1998 FIFA World Cup qualifiers to compete for a place in a major competition. Bosnia finished fourth in a group that included Greece, Denmark, Croatia and Slovenia. This was then subsequently followed by further disappointment with lackluster campaigns in the UEFA Euro 2000 qualifiers, as well as the 2002 FIFA World Cup. This early period was followed by Bosnia coming very close to qualifying directly for their first ever major competition, UEFA Euro 2004, narrowly missing out by a single goal against Denmark. Bosnia failed to make the grade in the 2006 FIFA World Cup qualifiers, despite being unbeaten at home, and the UEFA Euro 2008 qualifiers, which saw their poor home form cost them. Bosnia and Herzegovina then experienced double heartbreak, bowing out twice in the playoffs to Portugal, first 2–0 on aggregate in the 2010 FIFA World Cup decider and then 6–2 on aggregate in the UEFA Euro 2012 decider. Bosnia and Herzegovina qualified for the 2014 FIFA World Cup, hosted by Brazil, in October 2013 by beating Lithuania, finally breaking their curse and participating in a major tournament. Bosnian squad at their first ever FIFA World Cup game. (coach: Safet Sušić). They managed to finish third in a group which included Argentina, and tasted their first victory thanks to a 3–1 win over Iran. Nigeria pipped Bosnia for second place in the group with a 1–0 win marred with controversy following an incorrectly disallowed goal scored by Edin Džeko in the first half. Bosnia finished third in the UEFA Euro 2016 qualifiers behind Belgium and Wales. After making an unfortunate start to the qualifiers with a surprise 2–1 home defeat against Cyprus and managing just two points through four games, manager Safet Sušić was dismissed and replaced by Mehmed Baždarević. After the slow start, the Bosnian performance improved dramatically, with five wins in their remaining six matches, including victories over Wales and Israel along with three clean sheets. However, they ultimately failed to qualify after a two legged playoff encounter with Ireland. Bosnia failed to make back-to-back FIFA World Cups after failing to qualify to the 2018 FIFA World Cup. The following players were called up for Euro 2020 qualifying games against Armenia on 23 March and against Greece on 26 March 2019. Caps and goals correct as of 26 March 2019 after the game against Greece. INJ Withdrawn due to injury. U21 Called-up to U21 squad. Euro 1996 – Could not enter as the national team was not yet a member of UEFA. Table does not include results of minor tournaments (reserve players) managed by Husnija Arapović. Due to one match suspension of Mehmed Baždarević for unsportsmanlike behaviour, assistant manager Dragan Perić took charge of the team on 25 March 2017. Tables correct as of match played on 26 March 2019. Emir Spahić captained Bosnia at their first ever FIFA World Cup tournament. This is a list of Bosnia and Herzegovina captains for ten or more official and friendly matches. Note: Some of the other players to have captained the team include: Mehmed Baždarević (2 caps) 1996, Meho Kodro (5) 1997 to 1998, Vlatko Glavaš (1) 1997, Suvad Katana (2) 1998, Elvir Bolić (6) 1999 to 2000, Bruno Akrapović (4) 1999 to 2003, Hasan Salihamidžić (1) 2004, Zlatan Bajramović (1) 2006, Džemal Berberović (1) 2007, Asmir Begović (5) 2014 to 2017, Haris Medunjanin (4) 2016 to 2018, Vedad Ibišević (1) 2017. Table correct as of match played on 26 March 2019. FIFA-ranking yearly averages for Bosnia and Herzegovina. Their average position since FIFA World Ranking creation is 58. The Bosnian national team has more recently begun to use Stadion Grbavica, located in Sarajevo, for its' home games, following a renovation in 2018. The second of the two main stadiums of the national football team of Bosnia and Herzegovina is Bilino Polje, located in the city of Zenica. The stadium was built and opened in 1972, and is used to host matches of a more intimate atmosphere. On 10 August 2012, the Bosnian Association and the local government of City of Zenica financed the replacement of the old grass surface at the Bilino Polje Stadium. Another stadium Bosnia has used is City Stadium Koševo, also known as Olympic Stadium Koševo, for some of its' games. Its' training ground for domestic matches is the N/FSBIH Training Center in Zenica, which was opened in 2013 in conjunction with UEFA. A popular nickname of all Bosnian sport teams and/or sportsman is "Zmajevi" (Bosnian: zmajevi, lit. 'dragons'), popularized by football TV commentator Marijan Mijailović during Belgium vs. Bosnia (2-4) 2010 WC qualification game on 28 March 2009. General agreement among Bosnia and Herzegovina sports fans is that nick has historical context, it is considered as an allusion to the famous Bosnian general Husein Gradaščević, who fought for Bosnian independence, and who was known as the "Dragon of Bosnia". In both local and foreign media, they are sometimes referred to as the Golden Lilies, which was original nickname given to all country's teams and sportsman by fans after independence in reference to official state insignia at the time (flag and coat of arms), which itself referred to the Fleur-de-lis historical state insignia, featured on the coat of arms of the ruling Bosnian medieval Kotromanić dynasty. The team kit is currently produced by German sports apparel company Adidas. Also sponsoring the team are BH Telecom and Elektroprivreda Bosne i Hercegovine, companies from Sarajevo. Bosnian fans supporting the national team. A large number of national team's supporters come from Northern and Western Europe, North America, and some from as far away as Australia. Most of these fans are members of BHFanaticos, Belaj Boys, BHLegion, Armija Zmajeva (Dragons Army) and Ljuti Krajišnici groups. In the game against Norway, at the Ullevål Stadium in Oslo on 24 March 2007, Bosnian fans caused an hour-long delay due to an unprecedented amount of flares that had been thrown onto the pitch in protest against corruption in the (now former) Football Federation of Bosnia. On 1 June 2008, former Bosnia and Herzegovina players Meho Kodro and Elvir Bolić organised a friendly humanitarian game in Sarajevo called "Kodro, Bola and Friends" between former Bosnian football legends, in order to gain support, to say its time for changes in the Bosnian Football Association. The game was organised to commence at the same time as Bosnia and Herzegovina national side faced Azerbaijan in a friendly in Zenica. The attendance in Sarajevo was 15,000 while in Zenica only about 50. The game in Sarajevo was organised by the Federal TV who broadcast the humanitarian game live. A significant number of Bosnian International players were involved in the game, which ended 11–9 in favour of Team Kodro. Before every game, during the playing of the Bosnian national anthem, BH Fanaticos sing lyrics from the old national anthem Jedna si jedina, as the current national anthem does not have lyrics in all international sports Bosnia is part of (mainly football, basketball and handball). The table lists opponents played, sorted by members of FIFA affiliated confederations. Turkey 3 – 2 Edin Džeko's debut senior cap and first international goal. ^ radiofarda.com (28 May 2014). "تاریخ فوتبال بوسنی و هرزگوین از تهران آغاز شد". radiofarda.com. Retrieved 4 April 2015. ^ wildstat.com (4 April 2015). "Friendly internationals, Bosnia-Herzegovina". wildstat.com. Retrieved 4 April 2015. ^ wildstat.com (4 April 2015). "Friendly internationals, Iran". wildstat.com. Retrieved 4 April 2015. ^ Jonathan Wilson (1 May 2014). "Despite its inescapable past, Bosnia-Herzegovina writes new chapter". sportsillustrated.cnn.com. ^ "San ispunjen: Bosna i Hercegovina na Svjetskom prvenstvu!". sportsport.ba (in Bosnian). 15 October 2013. Retrieved 2 June 2018. ^ "Povijesni bodovi na Mundijalu: Pobjeda nad Iranom za kraj". sportsport.ba (in Bosnian). 25 June 2014. Retrieved 12 November 2018. ^ "Tako blizu, a tako daleko". sportsport.ba (in Bosnian). 18 November 2009. Retrieved 12 November 2018. ^ "Evropsko prvenstvo, ipak, samo pusti san". sportsport.ba (in Bosnian). 15 November 2011. Retrieved 12 November 2018. ^ "Adieu la France: Pali smo u Dublinu bez ispaljenog metka". sportsport.ba (in Bosnian). 16 November 2015. Retrieved 12 November 2018. ^ "Historijski rezultat: Zmajevi 13. na FIFA-inoj rang listi". klix.ba (in Bosnian). 8 August 2013. Retrieved 12 November 2018. ^ Al Jazeera Balkans (15 June 2014). "Naša brazilska priča (Our Brazil Story)". Sabahudin Topalbećirević (in Bosnian). Retrieved 18 June 2014. ^ Uefa.com (12 October 2003). "Denmark do just enough". UEFA. Retrieved 12 October 2003. ^ uefa (8 June 2005). "Spain – Bosnia-Herzegovina Match Report WC Q 2006". Archived from the original on 12 December 2013. ^ fifa.com (16 October 2012). "First-half flurry sees Bosnia-Herzegovina cruise". fifa.com. Retrieved 16 October 2012. ^ "Bosnia-herzegovina qualifies for first world cup". Goal.com. 15 October 2013. Retrieved 16 October 2013. ^ "Veliko slavlje nakon istorijskog uspjeha: Fudbaleri BiH idu u Brazil". slobodnaevropa.org (in Bosnian). 16 October 2013. Retrieved 11 November 2013. ^ "BiH će 2014. godinu pamtiti po historijskom nastupu na Svjetskom prvenstvu". bih.ba (in Bosnian). 30 December 2014. Retrieved 12 November 2018. ^ "Tuga među reprezentativcima BiH: Poništen nam je čist gol, oprostiti se časno od SP". bih.ba (in Bosnian). 22 June 2014. Retrieved 9 November 2018. ^ Chris Greenberg (21 June 2014). "Bosnia-Herzegovina Robbed Of Goal By Offside Call In Loss To Nigeria, Eliminated At World Cup". huffingtonpost.com. Retrieved 21 June 2014. ^ Joe Bernstein (25 June 2014). "Nigeria 1–0 Bosnia-Herzegovina: Peter Odemwingie scores only goal as Edin Dzeko and Co crash out of World Cup". dailymail.co.uk. ^ Jack Davies (17 November 2014). "Susic sacked by Bosnia-Herzegovina". goal.com. Retrieved 17 November 2014. ^ Maja Zuvela (17 November 2014). "Bosnia sack coach Susic after Israel fiasco". uk.reuters.com. Retrieved 17 November 2014. ^ "Fixture List – Centralised friendlies" (PDF). uefa.com. 28 July 2017. Retrieved 5 October 2017. ^ uefa.com (16 November 2015). "Walters double takes Ireland to UEFA EURO 2016". Retrieved 16 November 2015. ^ eurosport.com (16 November 2015). "Walters strikes twice to send jubilant Ireland to Euro 2016". Retrieved 16 November 2015. ^ "Prosinečki i Marinović objavili spiskove igrača". nfsbih.ba (in Bosnian). 11 March 2019. Retrieved 12 March 2019. ^ "Suspendovan Mehmed Baždarević!". sportsport.ba (in Bosnian). 25 December 2016. Retrieved 27 September 2017. ^ "Prvi put u historiji zmajeve će voditi stranac: Stéphane Gilli šef protiv Gibraltara". avaz.ba (in Bosnian). 15 March 2017. Archived from the original on 9 June 2017. Retrieved 2 October 2017. ^ "FIFA-ranking yearly averages for Bosnia and Herzegovina". fifa.com. Retrieved 16 November 2018. ^ "Od ruševine do novog doma reprezentacije BiH" (in Bosnian). sportsport.ba. 5 September 2017. Retrieved 9 October 2016. ^ "BiH dočekuje Belgiju na Grbavici!" (in Bosnian). oslobodjenje.ba. 4 September 2017. Retrieved 9 October 2017. ^ "Portuguese FA director laments pitch condition of Bosnia & Herzegovina Euro 2012 play-off match". goal.com. 8 November 2011. Retrieved 12 December 2012. ^ "Cristiano Ronaldo angry at Bilino Polje surface qualifty in 2011". youtube.com (in Bosnian). 11 November 2011. Retrieved 14 January 2013. 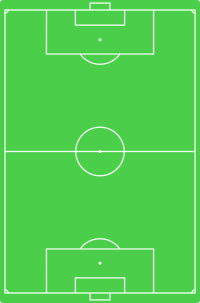 ^ "Grass surface replacement Bilino Polje". vimeo.com. 7 August 2012. Retrieved 3 September 2013. ^ "Počela ugradnja travnate površine na Bilino polje" (in Bosnian). sportsport.ba. 7 August 2012. Retrieved 9 September 2012. ^ "Postavljena trava na Bilinom Polju" (in Bosnian). sportsport.ba. 10 August 2012. ^ "Michel Platini otvorio Trening centar NSBiH u Zenici vrijedan 10 miliona KM!" (in Bosnian). klix.ba. 2 September 2013. Retrieved 28 March 2016. ^ "BH Dragons" (website). USA: bhdragons.com. Retrieved 19 January 2014. ^ "Golden Lilies blossoming". FIFA.com. 9 April 2009. Archived from the original on 12 April 2009. Retrieved 10 October 2009. ^ nezavisne.com (17 November 2009). "Bh. telekom zlatni sponzor". nezavisne.com (in Bosnian). Retrieved 30 March 2012. ^ bihsoccer.com (12 November 2006). "Reprezentacija Bosne i Hercegovine". bihsoccer.com (in Bosnian). Archived from the original on 15 July 2012. Retrieved 8 December 2012. ^ a b c d bhdragons.com (21 December 2013). "The History of the Bosnian National Jersey". bhdragons.com. Retrieved 21 December 2013. ^ adidas.com (21 March 2014). "adidas to partner Bosnia and Herzegovina ahead of 2014 FIFA World Cup Brazil™". adidas.com. Retrieved 21 March 2014. ^ BHFProduction (2 October 2010). "BHFanaticos–Gdje Ti Igraš Tu Smo Mi". YouTube. Retrieved 2 October 2010. ^ Albin I. (22 March 2013). "Bosnian fans from Australia (Bosnia–Greece 3:1)". facebook.com. Retrieved 22 March 2013. ^ Vic (28 March 2013). "Bosnia Fans Make the Most of Being Stuck on a Bridge". sportige.com. Retrieved 28 March 2013. ^ Emin D (22 March 2013). "BHLegion fans go to Bilino". zenicablog.com. Archived from the original on 25 March 2013. Retrieved 22 March 2013. ^ Emin D (22 March 2013). "BHFanaticos fans go to Bilino". zenicablog.com. Archived from the original on 25 March 2013. Retrieved 22 March 2013. ^ Rosenborg Trondheim (24 March 2007). "Bosnian supporters–protest including pyro (Norway Bosnia)". YouTube. Retrieved 27 March 2006. ^ Brza zmija (1 June 2008). "Fotogalerija: Kodro, Bola i prijatelji". SportSport.ba (in Bosnian). Retrieved 1 June 2008. ^ Statler (1 June 2008). "BiH–Azerbejdzan". SportSport.ba (in Bosnian). Retrieved 1 June 2008. ^ I. Babic (25 May 2008). "Svi na Kosevo–Spasimo bh fudbal". SportSport.ba (in Bosnian). Retrieved 25 May 2008. ^ Statler (1 June 2008). "Live–Spektakl na Kosevu". SportSport.ba (in Bosnian). Retrieved 1 June 2008. ^ BHFProduction (14 June 2008). "Skenderija pjeva, Jedna si jedina". YouTube. Retrieved 14 June 2006. ^ Ministry of Justice of Bosnia and Herzegovina (4 June 2010). "Proposal of the Text for the National Hymn of BiH Adopted by the Council of Ministers of BiH". Archived from the original on 22 June 2009. Retrieved 10 May 2010. ^ "FIFA Men's Ranking 23 October 1996". FIFA.com. 1996. ^ "FIFA Men's Ranking 20 August 1997". FIFA.com. 1997. ^ "FIFA Men's Ranking 14 March 2013". FIFA.com. 2013. ^ "FIFA Men's Ranking 1 October 2015". FIFA.com. 2015. ^ "FIFA Men's Ranking 3 March 2016". FIFA.com. 2016. Wikimedia Commons has media related to Bosnia and Herzegovina national association football team.